Southern Illinois University Edwardsville’s division of Enrollment Management and the Office of Undergraduate Admissions are hosting the Illinois Association for College Admission Counseling (IACAC) Camp College program today through Friday, July 14 on the SIUE campus. Camp College provides Illinois rising seniors with the unique opportunity to learn about the college search and application process firsthand from college admission professionals and high school counselors. 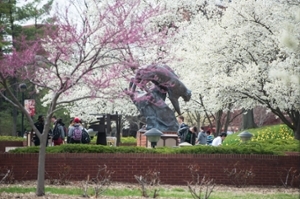 Activities take place in the Morris University Center, Peck Hall, Rendleman Hall and Evergreen Hall. Participants learn about navigating a college fair, essay writing, identifying college fit/match, financial aid and many more useful topics. In addition, campers are paired with a counselor/mentor who they retain for the 2017-18 school year. The students stay in Bluff Hall for the duration of the camp, and enjoy breakfast and lunch each day in the Morris University Center. For details regarding IACAC Camp College, contact the SIUE Office of Admissions at 618-650-3705.